Time is money, especially when it comes to business travel. How many times have you missed a flight or spent too much money on a rental car because you didn't have the right information handy when you needed it? Staying organized and informed on the road can be a major headache. Get deals on flights, hotels and car rentals. Most business travelers make their travel reservations using a computer from home or work. But once you're on the road, plans can change and you may need to quickly find a good price for plan B. One tool to consider is Kayak, which aggregates deals from online travel agencies, hotel chains, car rental companies and other aggregators such as Travelocity and Priceline.com. It provides comparison tools in a mobile-friendly format that lets you quickly find available deals on the go. To actually make a reservation, Kayak sends you to the website of the airline or other travel company to do the transaction. Some of those sites are more mobile-friendly than others, and sometimes the deals available there don't exactly match what Kayak displays. But overall, the Kayak app provides a fast, useful overview of your best options and can help you avoid paying too much. Kayak is free and available on iOS, Android, Nokia, Windows Phone 7 and the mobile web. In addition to Kayak, you might want to install the free mobile apps for the airlines and other travel services you use most and preconfigure them with your login information. This can help save time, compared to logging in via their mobile websites. Organizing flight, ground transportation, hotel and other trip information into a coherent itinerary can be a time-consuming, tedious and error-prone task. 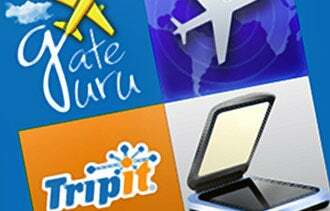 TripIt is a "freemium" online service that removes much of the drudgery. Forward your reservation confirmation emails, and TripIt will extract the details and create an itinerary. You also can connect Tripit to your online calendar so that your reservations automatically appear on the calendar. You can add maps, directions, custom notes, mobile alerts and reminders, as well as share your itinerary with whomever you choose. TripIt is available free on iPhone, iPad, Android, BlackBerry, Windows Phone 7 and the mobile web. Pro subscription ($49 a year) provides extra services that can be accessed through the app. Is your flight still on time? Has the gate changed? FlightTrack is one of the easiest-to-use apps to get information about specific flights from more than 5,000 airports and 1,400 airlines. It includes maps, flight statistics and more. The app is available free for iPhone, iPad, Android, BlackBerry and Windows Phone users. The pro version costs $4.99 and integrates with your itineraries on TripIt. Know what's where at the airport. Airports can have a lot of amenities to help you make better use of your time and money, whether you're dashing through or hanging around on an unexpected delay. But finding out what's available, in which concourse or terminal and on which side of security, can be a challenge. Enter GateGuru, which contains information on amenities and services at over 150 airports, with user reviews. GateGuru is free and available for iPhone and Android devices. One crucial airport service that GateGuru does not cover is Wi-Fi hotspots. The free app Wi-Fi Finder -- for iPhone and Android -- lets you search for nearby free and paid hotspots listed in its database, not just at airports but anywhere. All those little paper receipts can be annoying to handle and easy to misplace. Fortunately, with the right app, your smartphone camera can be a document scanner. Turboscan is a free iPhone document scanner app that saves images as PDF or JPG image files, which you can then e-mail or send to a cloud storage service such as DropBox. Or try DroidScanLite, a similar free app for Android phones. Now, you don't have to worry if you lose those slips of paper. Another option is ProOnGo, a more comprehensive expense tracking service. Not only can it scan your expenses but it also files them in custom templates and send them to QuickBooks. Subscriptions start at $27 a month for up to five users. If you do a lot of business travel, using any one of these apps can be a worthwhile investment for the time and trouble they can save.